I'm standing beside a recovering cowfish in a sickbay. It's not clear what her ailment is, but she watches me with a glint of sadness in her eyes. Then she blows a kiss, or at least with her pursed lips it sure looks like she does. Her tank is marked QUARANTINE. Andrea Poe is a journalist who covers travel and lifestyle issues around the globe. I've encountered this cowfish thanks to an enthusiastic guide called Allan, who takes us on a behind-the-scenes tour of the National Aquarium in Baltimore. After our visit to the sick bay, he leads us beneath a complex system of pipes and tubing, the filtration system, into a brightly lit surgery center that functions mostly as an autopsy room. "We never just wonder what happened to an animal here," he explains. "We dissect it to see what we can learn about the death." Allan pulls a plastic grocery bag from the fridge marked "NECROPSY" and presents a brittle turtle shell. He encourages us to touch the thick ridges that bisect the inside of the shell. "The backbone of a turtle," he says smiling widely. "No one really thinks about that when they see a turtle. Cool, huh?" At that moment I realize it's the unbridled enthusiasm of people like Allan who work at the National Aquarium that makes the behind-the-scenes tour so much fun. Even an innocuous detour through staff offices reveals the staff's passion for marine life: stuffed animals, sketches and figurines clutter their workspace. 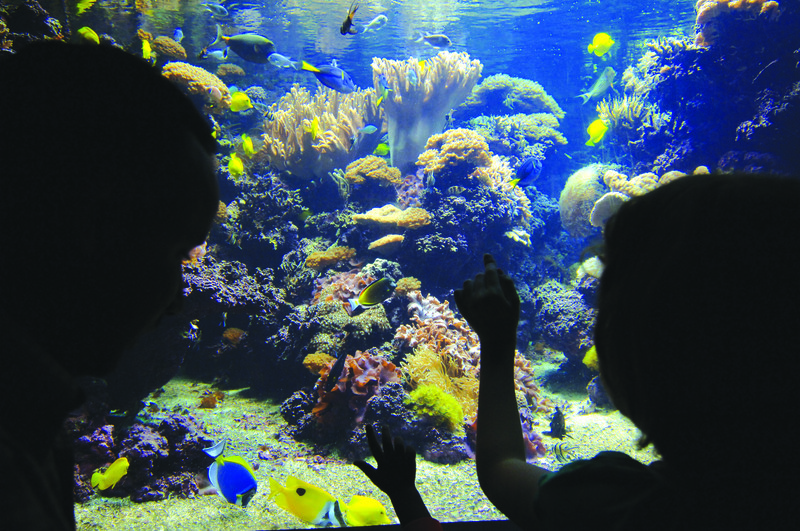 The National Aquarium has become a leader in conservation in recent years thanks to its rescue and rehab programs, along with the cessation of its dolphin shows. The scale, scope and, yes, style of this forward-leaning aquarium which tens of thousands of sea animals--from stingrays to lizards to jellyfish--call home is one of the country's most visited. The standout attraction is the Blacktip Reef, which houses black tip sharks and recreates the full eco-system of an Indo-Pacific Reef. Although the museum is less than hour from downtown DC, I overnight in Baltimore at the Hotel Monaco, which is in walking distance of the National Aquarium on the Inner Harbor of the Chesapeake Bay. The hotel offers an irresistible aquarium package that includes a loaner goldfish. It also includes two (fast track) tickets to the aquarium, which means you skip what can be long lines, plus breakfast and a ten-percent discount at the hotel's B & O American Brasserie. Families can choose rooms with bunk beds and during my visit I met a newlywed couple from Pennsylvania who booked this package as a post-wedding treat for themselves. For me, a highlight was the free happy hour from 5-6, where Bellinis and wine are poured with gusto. Oh, yes, and there's always savory treat, too. On the night I stayed over: arancini with tomato-basil dipping sauce. Back in my room I scored twin goldfish to keep me company. Although one flitted about the faux coral rambunctiously, the other seemed more pensive. His bulging eyes weren't exactly soulful, but they were curious. He seemed to be watching me. I place the goldfish bowl on the bedside. That night when I turned out the light t the Hotel Monaco, I couldn't help but think of the very different lives of their brethren living just a few blocks away.